From Booking to Getting Paid this book tells you everything you need to know to guide you through your first gigs or damage control the bad ones. The book covers everything that any band or solo artist needs to know about booking gigs and getting paid for those gigs and how to get along with the sound engineer. Do you know what a Talent Buyer is? Do you know what he/she is looking for? Do you know the things to say to a Talent Buyer that will get you booked and the things to avoid saying that will hurt your chances? We know and we’ve written it all out for you in the section on Booking. Wondering about whether or not to enter that Battle of the Bands? Or how to win that competitive showcase? Or what that music venue really wants from you? Or what happens if you piss off the bartender? Or why didn’t you get a sound check? Gigging answers all these questions. Need to get some some press? Want to take your band to the next level? This book will help you there, too. Available as electronic download only. Buy the book now as a PDF download, Only $6.99! readable on almost any device! Read it here – Now Only $4.99 Limited time offer at this price!! 2nd Edition includes 20 pages of new material! “Sooner or later every band will be invited to enter a Battle of the Bands. Each band struggles with the decision of whether or not they should enter. We have been there and done that as everything from a spectator rooting for our favorites to being a judge and deciding who the winner will be. So we’re going to lay it all out there so you can make the best possible decision. Read the rest, buy the book here now! Join the thousands of other musicians just like you who have read this book and put it’s practical common sense lessons to use in the real world! 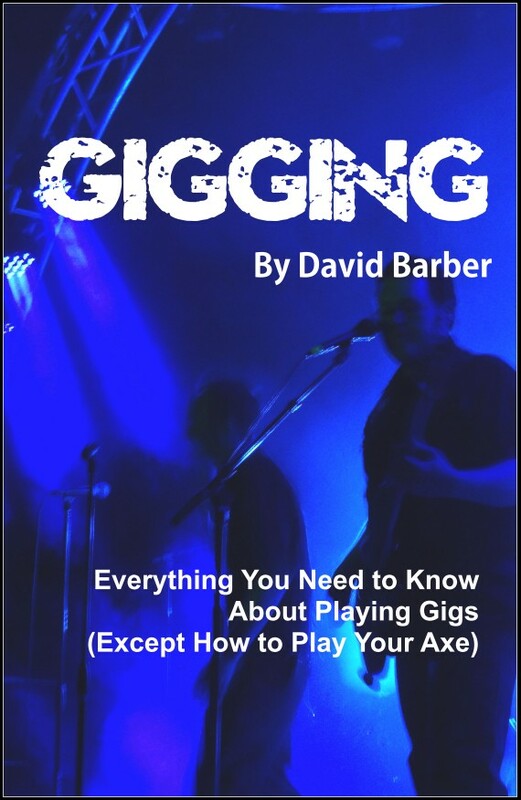 Buy Gigging, the book, here now! Buy Gigging the book here now! How do you book a gig? What does the booking person really want to hear? Why aren’t you getting repeat bookings? Should you hire a booking agent? How do you promote your gig? Should you use Twitter? or Facebook? or any of the others? How do you get publicity? What should you do to prepare for your upcoming gig? Where do you load in? What should you bring to the gig? What does the sound guy do? What is a line check? What is a Back Line? What should you do if they try to rip you off? Should you enter a battle of the bands? Who always wins battles of the bands? How can you get into a showcase? Will there be a built-in crowd? What is the green room for? Should you get high in the green room? All these questions and many more are answered in this book!